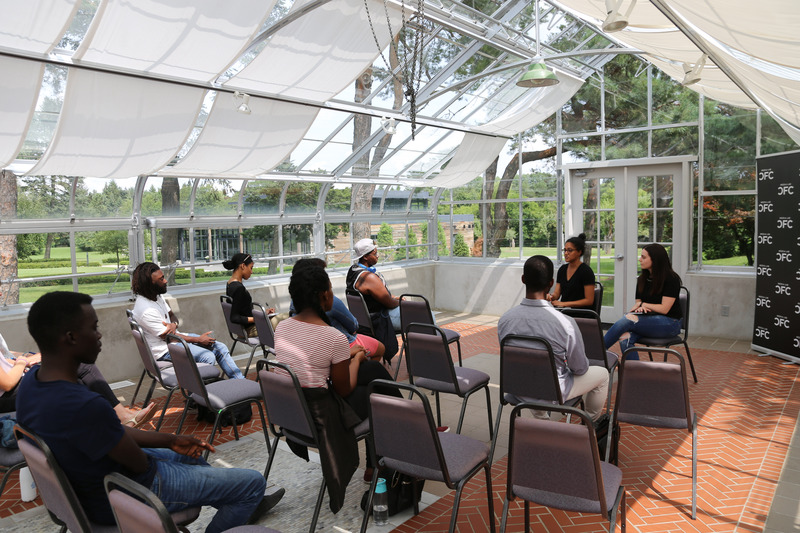 On Monday, August 20, the Canadian Film Centre (CFC) welcomed guests from Black Youth! 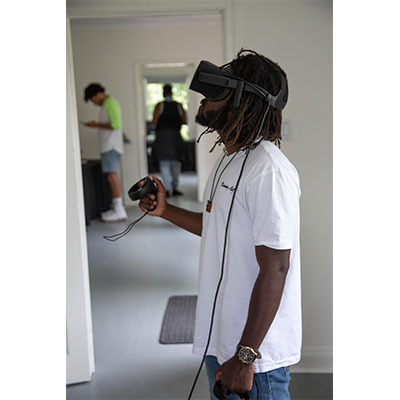 Pathway 2 Industry to learn about potential career options in the digital, film and television industries, as well as experience some virtual and augmented reality (VR/AR) demos from several IDEABOOST-Network Connect companies gathered onsite. Black Youth! Pathway 2 Industry is a three-year initiative supported by the Ministry of Child and Youth Services that aims to support and assist Black youth to attain opportunities in the digital media, television and film industry. The program provides both interpersonal and technical skills essential for the youth, post-secondary-educated in film, performance arts and digital media, to pursue their goals and find work in this sector. It scaffolds an introduction to various sectors of Canada’s media industry through tours, workshops lead by high-level industry leaders, career counselling, networking support for freelancers, and job training and placement. Program partners include Goldelox Productions, Mattru Media, Hungry Eyes Media, Toronto International Film Festival, VTAPE, NABET, Toronto Public Library, the Regent Park Film Festival, and Live it to Learn it. Students from Black Youth! Pathway 2 Industry learning about the CFC. Nia Mascoll-Callender, Program Coordinator at Black Youth! Pathway 2 Industry, wanted the youth to visit the CFC for two reasons: because the CFC keeps up with the ever-changing landscape of the film/digital industries, and to expose the youth to the ways in which both the CFC’s Programs and Media Lab serve and support young Canadian creatives. The afternoon kicked off with Nafisa Murji, Manager of Talent and Content for CFC programs, and Rachel Baitz, Coordinator, Programs and Talent, giving an overview of CFC's Programs in Film, Television, Music and Acting. 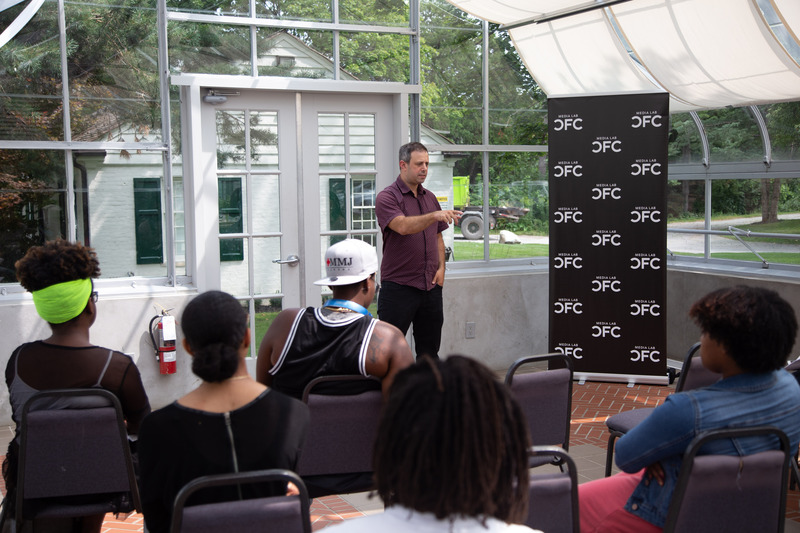 In particular, Murji focused on the CFC’s Cineplex Entertainment Film Program for Directors, Editors, Producers and Writers, while Baitz described how the CFC strives to get the music residents’ talents onscreen through collaborative workshops. Collaborative work also is key in the Bell Media Prime Time TV Program, where resident writers work in a writer’s room to develop an original series as a team during the first half of the program, and then an individual series in the second half. Given the many editors, musicians and actors in the crowd, Murji and Baitz welcomed enthusiastic questions regarding application process, program structure, program fees, and even if they could apply for more than one program! Nafisi Murji and Rachel Baitz from CFC Programs answering student's questions. Nataly De Monte, associate director of CFC Media Lab, spoke as well, introduced CFC Media Lab, describing its focus on accelerating Canadian talent in VR, AR, artificial intelligence (AI) and machine learning, particularly through the IDEABOOST Accelerator and startup affiliates group, Network Connect. De Monte then introduced Elli Raynai, co-creator of the VR experience Made This Way: Redefining Masculinity, who explained his and co-director Irem Harnak's collaborative creative process of making VR. Raynai also shared the exciting news that Made This Way is screening in competition at the Venice International Film Festival this week through September 8. 'Made This Way' discussion led by co-creator Elli Raynai. 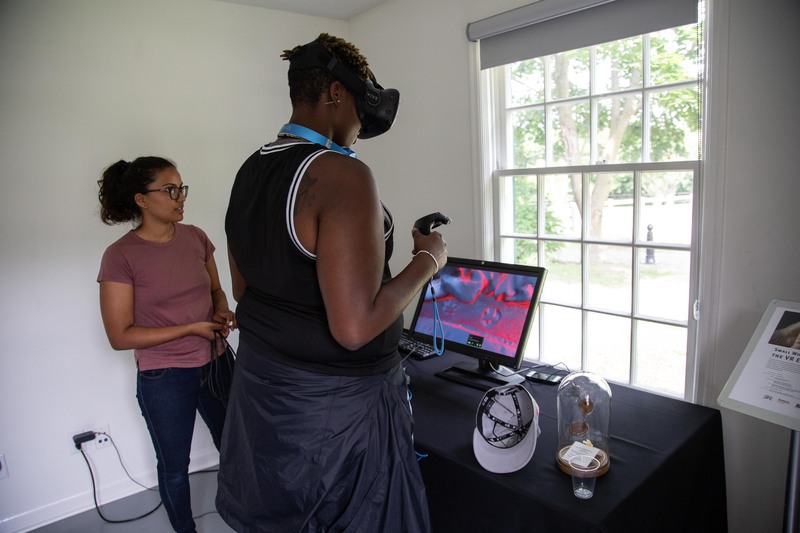 Small Wonders: The VR Experience allows audiences to immerse themselves into a prayer bead and explore the intricate carvings, made visible through micro-computer tomography (Micro-CT) and VR. 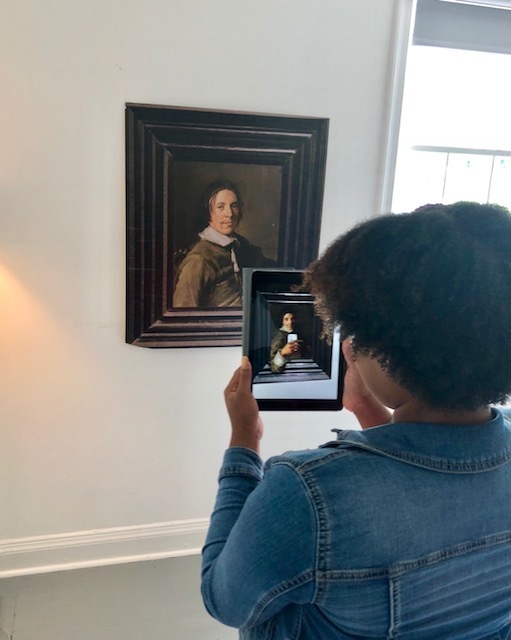 Impossible Things were commissioned by the Art Gallery of Ontario for their exhibit, ReBlink, which digitally “re-mixes” a curated set of paintings from the collection and offers new modes of engaging with art. 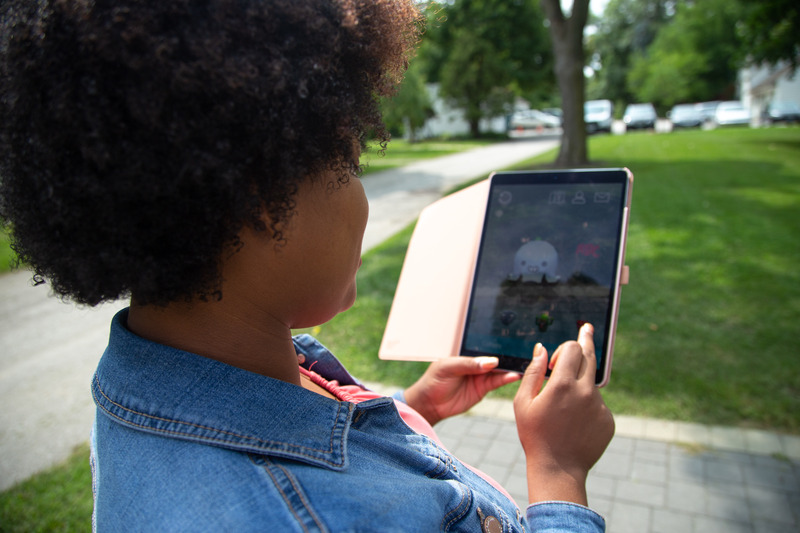 LARGE (Location-based Augmented Reality Gaming Engine) was designed by Albedo Informatics as a platform that allows anyone to create and share rich AR content with just a mobile device. Raynai posed an interesting question to the youth, “Is the content you are currently watching on YouTube interesting?”, to which a student shared her recent experience of a YouTube channel testing out VR. She in turn asked Raynai for his opinion on the future of YouTubers and other digital content creators exploring VR technology. Raynai explained that seeing as VR is a growing medium, it is expected that many content creators will explore and expand the potential that VR holds. The youth were very engaged with Raynai's query, “What does a VR film look like?”, noting that a VR film can be anything they want it to be, given the flexibility of the medium, as well as how audiences are able to move within the physical environment and interact with characters and experience the story in a meaningful way. Given the changes VR and AR are making, one recurring question was: “Is this going to change certain jobs?” They asked about editing content, and how VR content is cut differently. Raynai advised them to explore VR as its own medium, and to create their own film language using VR. Because the path, medium and industry are more open and less competitive, there may be more room to break in and find work early in their careers. We at the CFC are excited to see which paths the youth travel and hope to see them in CFC projects and programs in the future.